A 15-day-old neonate presented with decreased activity and rapid breathing for a day. On examination he had cyanosis with oxygen saturation of 80% and signs of cardiovascular collapse. The antenatal history was significant for oligohydramnios. He was born of a full-term emergency cesarean delivery (meconium-stained amniotic fluid) and had birth weight of 2.5 kg. Family history was significant for death of a paternal uncle at the age 15 years due to spontaneous intracerebral thrombosis. The chest X-ray was unremarkable. The ABG showed severe respiratory and metabolic acidosis with severe hypoxemia. Echocardiography revealed a structurally normal heart except a small secundum atrial septal defect with right to left shunt. The right ventricle was enlarged with moderately elevated right ventricular pressure. There was a thrombus completely occluding the lumen of the right branch pulmonary artery with absent distal flow. The flow to the left pulmonary artery was sluggish [Figure 1]. 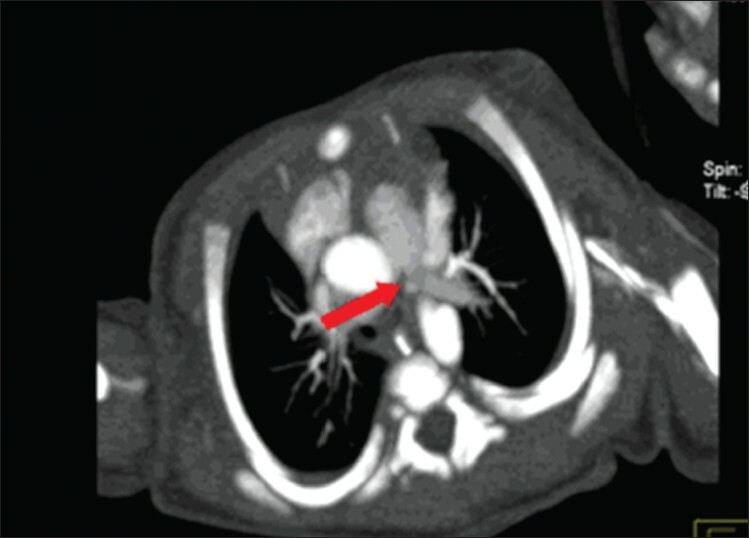 A CT scan of the chest with angiography confirmed the presence of a thrombus completely occluding the right pulmonary artery and the lobar branches of the left pulmonary artery [Figure 2]. His blood investigations, including the prothrombotic work up (protein C, protein S activity, antithrombin III level, factor V Leiden mutation, anticardiolipin antibodies, and serum ANA), were normal. He received thrombolytic therapy with tissue plasminogen activator (Alteplase) at 0.1 mg/kg/h (at 4 hours from presentation to our center). The dose was doubled after 6 hours as there was no improvement. Over the next 12 hours, the perfusion and cyanosis slowly improved and ABG normalized. The fibrinogen level was maintained above 100 mg/dl. 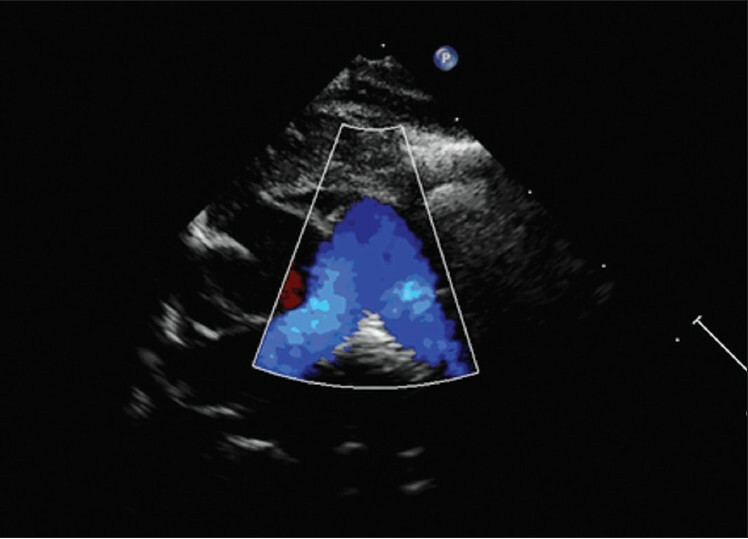 Serial echocardiograms demonstrated completely dissolved thrombi in both the pulmonary arteries with normalization of pulmonary pressure and left to right shunt across the ASD at the end of 36 hours [Figure 3]. The thrombolytic therapy was stopped after 24 hours and replaced with intravenous heparin. 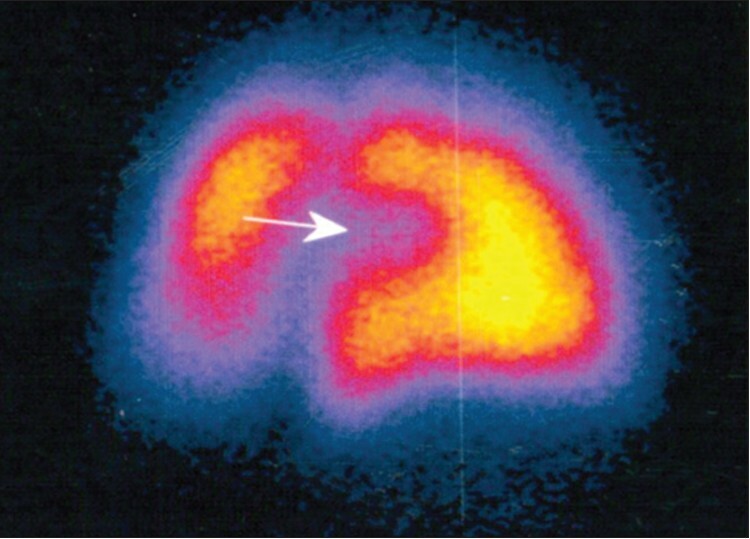 Prior to discharge, a lung perfusion scan was obtained which showed patchy residual segmental perfusion defects in both the lung fields [Figure 4]. The neonate was discharged home on daily subcutaneous low-molecular-weight heparin. It was given for 3 months. At 3-month follow-up he was doing well and there was no thrombus in the pulmonary artery. A 3-day-old neonate was referred for management of persistent pulmonary hypertension (PPHN). She was a full-term neonate born by normal vaginal delivery. There was birth asphyxia requiring minimal resuscitation. An echocardiogram performed at the primary care center on day 2 of life-detected PPHN (atrial septal defect and ductus arteriosus shunting right to left; structurally normal heart). She had parasternal pulsations and soft systolic murmur. Cyanosis (85-88%) and a murmur were noted. She was hemodynamically stable. The chest radiograph was unremarkable. The echocardiogram showed dilated right atrium and right ventricle with mild mitral and tricuspid regurgitation. The pulmonary arterial pressures were systemic. There was a single thrombus (3 × 5 mm) in the proximal left pulmonary artery with slightly decreased distal flow [Figure 5]. 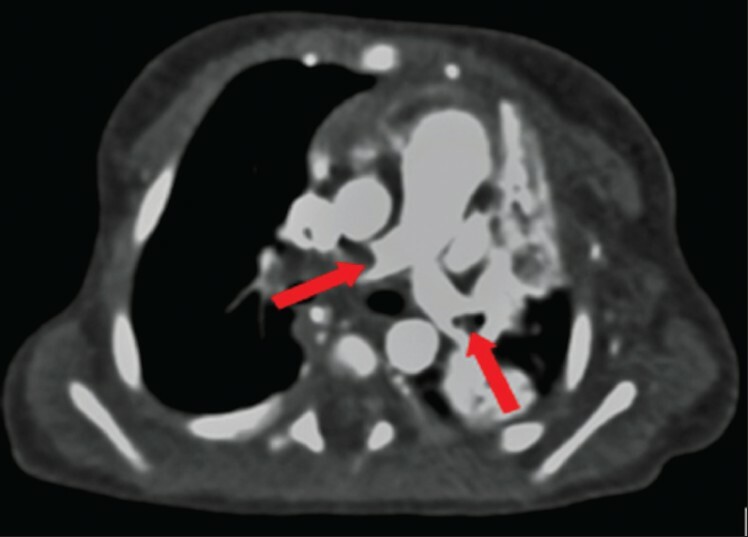 A chest CT with angiogram confirmed this [Figure 6]. A retrospective review of the earlier echocardiogram (day 2 of life) showed the thrombus there as well. Her prothrombotic work-up was negative. She received anticoagulation therapy with continuous intravenous heparin for 48 hours followed by subcutaneous low-molecular-weight heparin as maintenance therapy. The follow-up echocardiogram after 48 hours showed a modest decrease in the size of the thrombus with an increase in forward flow. The pulmonary artery pressure was near normal. The low-molecular-weight heparin was advised for 3 months but the child was lost to follow up. The treatment options available for thrombus in neonates are anticoagulation with heparin, low-molecular-weight heparin or thrombolytic therapy with tissue plasminogen activator, surgery, and catheter-based embolectomy. A recent systematic review provided no conclusions about the most appropriate treatment, as no eligible studies were found. Thrombolytic therapy seems to be the most preferred treatment option particularly in the case of hemodynamically compromising pulmonary embolism. Another option is transcatheter thrombectomy. For thrombolysis, tissue plasminogen activator (tPA) is the agent of choice because of improved clot lysis in vitro compared with that using urokinase and streptokinase, fibrin specificity, and low immunogenicity. The most important complication of tPA is bleeding. The fibrinogen levels need to be maintained above 100 mg/dl. We achieved successful thorombolysis in our first case. The second patient was hemodynamically stable and had less extensive thrombi. Hence, we decided to use intravenous heparin infusion. Maintenance therapy with subcutaneous heparin is the preferred option in view of efficacy, less side effects, and less monitoring. It can be given for 3 months once the prothrombotic work-up is negative. 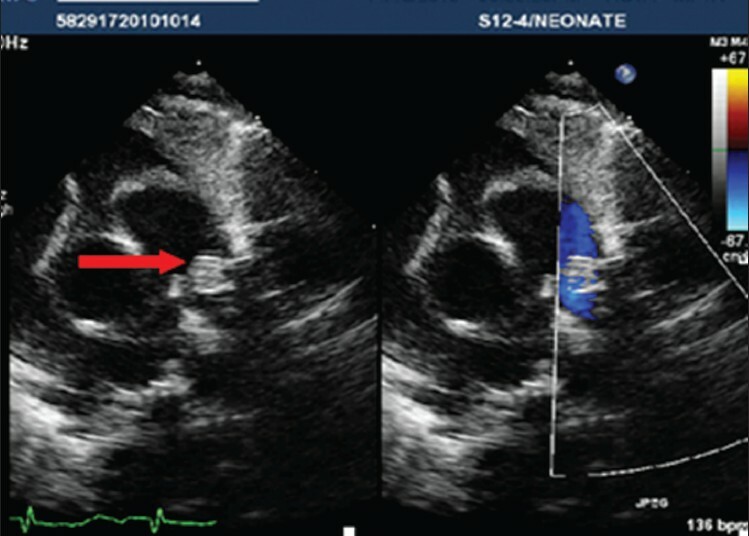 When assessing a cyanotic neonate with a structurally normal heart echocardiographically, it is important to look for pulmonary artery thrombi before labeling the study as PPHN. This has obviously vital implications. 1. Andrew M, David M, Adams M, Ali K, Anderson R, Barnard D, et al. Venous thromboembolic complications (VTE) in children: first analyses of the Canadian Registry of VTE. Blood 1994;83:1251-7. 2. Chalmers EA. Neonatal thrombosis. J Clin Pathol 2000;53:419-23. 3. Sawyer T, Antle A, Studer M, Thompson M, Perry S, Mahnke CB. 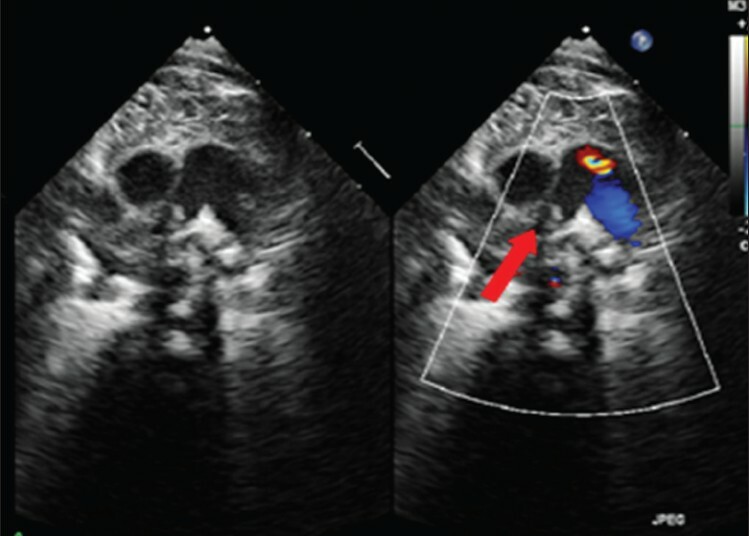 Neonatal pulmonary artery thrombosis presenting as persistent pulmonary hypertension of the newborn. Pediatr Cardiol 2009;30:520-2. 4. Werthammer J, Pritt A, Laura R, Brown L, Heydarian M. Pulmonary embolism presenting with sudden respiratory failure in two previously stable neonates. J Neonatal Perinatal Med 2010;3:57-61. 5. Kenny D, Tsai-Goodman B; Neonatal arterial thrombus mimicking congenital heart disease. Arch Dis Child Fetal Neonatal Ed 2007;92:F59-61. 6. Remy-Jardin M, Pistolesi M, Goodman LR, Gefter WB, Gottschalk A, Mayo JR, et al. Management of suspected acute pulmonary embolism in the era of CT angiography: a statement from the Fleischner Society. Radiology 2007;245:315-29. 7. John CM, Harkensee C. Thrombolytic agents for arterial and venous thromboses in neonates. Cochrane Database Syst Rev 2005:(1):CD004342. 8. Parasuraman S, Goldhaber SZ. Venous thromboembolism in children. Circulation 2006;113:e12-6. 9. Monagle P, Chalmers E, Chan A, DeVeber G, Kirkham F, Massicotte P, et al. Antithrombotic therapy in neonates and children: American College of Chest Physicians Evidence-Based Clinical Practice Guidelines (8th Edition). Chest 2008;133(6 Suppl);887S-968S.